It is a perfect Monday morning at the stately, elegant bungalow on 15, Aurangzeb Road in the capital. As a gentle breeze blows through the estate and birds chirp in the background, Bhai Analjit Singh opens the large wooden doors of his house to let out his two golden retrievers — whom he calls his fourth and fifth children — on to the perfectly manicured lawn. “It is a nice day, but you never know, this might not last more than 15 minutes,” he says. This short encounter perfectly sums up Analjit Singh’s approach to life and work. Life has taught him to be circumspect even when the going is good. As a result, he’s learnt never to take anything for granted. And so today, after almost a decade of trial and error, even as good karma seems to be finally trouncing the bad, Analjit is busy figuring out new ways to secure the future of his family and business. The Rs. 7,250 crore Max India Group that Analjit Singh built after selling his stake in telecom firm Hutchison Max to Hongkong-based tycoon Li Ka-shing back in 1998 is finally hitting a sweet spot. His life insurance business, built through a joint venture with New York Life, is on the verge of turning profitable this year. The Max healthcare business is just beginning a massive, yet carefully orchestrated expansion. And Max Bupa, the health insurance joint venture with Bupa, has got off to a good start since its debut a year ago. All these good tidings might make the bitter family disputes that Analjit Singh had to endure in the past a distant memory and his initial trials just a footnote in his mercurial career. But he hasn’t forgotten them. In fact, he remembers them so well that he is drawing lessons to avoid their repetition in his own family. To achieve that, Analjit has now put in place a new governance model at Max. In this pathbreaking endeavour he is getting help from some of the best minds in the business: World-renowned management guru Ram Charan and two of Singh’s closest confidants, Anuroop ‘Tony’ Singh and Ashwani Windlass. He has also spent time scouting for luminaries from around the world to join his board — and then also giving them the freedom to challenge him and his CEOs to raise the bar. And it seems to be paying rich dividends already. At home, his three children — son Veer, 27, and two daughters, Piya, 28 and Tara, 24 — are about to embark on their own entrepreneurial journeys. Singh says he is enjoying working with the next generation — each with their own ideas and bundles of new energy — to build the platform for four new ventures in integrated medicine, senior living, medical education and hospitality. This is part of his larger plan to train the youngsters to be “responsible owners”. And that means his children don’t get any operational roles in the publicly listed company. Alongside, a detailed process has recently been kicked off inside the family to build a trust and a family office to preserve — and conserve — the family wealth. It almost looks picture perfect. But the indulgent family man and the seasoned businessman knows that it doesn’t take long for the weather to change. He needs to remain vigilant and consolidate the gains he has made so far. For Analjit Singh, the journey of discovery has just begun. For more than two decades, Analjit Singh stood witness and was a part of the messy disintegration of what was once the Indian pharmaceutical industry’s first family. It had all started in 1990 when differences cropped up over how Ranbaxy patriarch Bhai Mohan Singh divided assets among his three sons — Parvinder, Manjit and Analjit. In that family settlement, Ranbaxy went to the eldest sibling, Parvinder, much of the real estate went to Bhai Manjit Singh, and Analjit was left with just an overstaffed factory at Okhla. Three years later, the father was ousted from Ranbaxy by Parvinder in a boardroom coup. While the dispute in courts dragged, things took a turn for the worse with the demise of Bhai Mohan Singh in 2006. Claims and counter-claims were made on his father’s will. Though Analjit eventually made peace with his nephews — Malvinder and Shivinder after their father passed away in 1999 — differences with brother Manjit continue, spilling over to, among other things, the Aurangzeb Road mansion where Analjit now lives. Then, in 2008, much to Analjit’s horror, his nephews cashed in by selling the family jewel Ranbaxy to Japanese pharma giant Daiichi Sankyo for $2.3 billion. Singh won’t admit it publicly, but his close associates say that the Ranbaxy sell-off affected him deeply because he saw it as family silver being squandered away. That is why, for more than two years now, Singh, who ranks No. 82 on the Forbes India Rich List, has been putting in place mechanisms that ring-fence his company from the any needless interference from the promoter family, including himself. “I want Max India to be promoter-governed and not promoter-managed. I don’t want the interests of the family ever to hamper the interests of the company,” says Analjit. Even the entire family estate has been protected through a team of trustees. “Even if I suddenly go mad and do something crazy, the independent trustees have the veto power to over-ride my decisions,” he says. Earlier this year, Analjit registered two trusts to manage his assets, including shares in Max India. One of them was Neeman Foundation Trust. The trustees, including his wife Neelu and Tony Singh, have the rights to exercise his will. “Every kind of eventuality has been thought of. I have talked to my children and they are aware,” says Analjit. Based on the advice from Ajay Bahl of AZB, a leading corporate law firm, the trust lays down explicit rules for the division of assets, in the event that there is no consensus among his children on the way forward. In designing the powers of the trust, Analjit has ensured that even he doesn’t have full power over the trusts. If four out of the five trustees vote against him, Analjit can be stopped from taking any step that might be “detrimental” to family interests. A part of this plan is his vision for his children. First, he is helping them set up businesses that will be kept separate from Max India. This will see the family enter sectors like hospitality, medical education, integrated pharmaceuticals and senior homes. Second would be their role in Max India. “They will not come into the mainstream (operations) of any of the Max companies,” says the father. Analjit would rather build a professional cadre of managers in his listed entity while helping his children write their own destiny. And here, Ram Charan, Tony Singh and Analjit are advising them personally on how to lead from the front through regular one-on-one sessions on how to build sustainable enterprises. For instance, Ram Charan has direct access to the three children and he often meets them for regular ‘story-telling’ sessions. The sessions cover a range of issues — the responsibility of being owners, how to recruit the top talent, how to measure whether a company is successful, the duties of a board and or indeed how to get the board members to work with each other and with them. And these lessons aren’t academic but built around stories of successful entrepreneurs around the world. Even to insiders, it is not easy to understand Analjit Singh’s obsession with governance and his decision to stay away from day-to-day management. But they are part of his evolution. Ever since he returned to India after his MBA at Boston University to found Max India in 1982, Analjit had acquired a reputation for being a compulsive serial entrepreneur. For the next two decades, he dabbled in a spate of businesses, entering and leaving as many as 10 joint ventures and as many businesses. It was during the course of one of his more successful ventures — the 51:49 joint venture with Hutchison Whampoa for mobile and telephony — did the idea of investing in professional CEOs come in. “It was during the Hutchison Max days that I first made the decision of separating myself from day-to-day operations. The telecom business was complex and it needed a professional,” recounts Analjit. The telecom joint venture had a professional CEO almost from the start. Analjit cashed out in 1998. He gave up a 41 percent stake and walked away with a war chest of Rs. 561 crore to either retire or start new businesses. For about six months, it seemed as if Analjit would hang up his boots. And then the entrepreneurial alter ego took over. Backed by advice from McKinsey, Analjit entered four new, sunrise sectors: Life insurance, healthcare, IT enabled services and clinical studies. Three of them, barring IT enabled services, eventually proved to be a success and now bring most of the revenues on the books of Max India. Yet, getting the model right on healthcare was time-consuming. While the life insurance business got off to a good start under the leadership of Tony Singh and with the help of an experienced JV partner, it took extra effort from Analjit to get the model right for the hospital chain business of Max Healthcare. While Apollo and Fortis were building big hospitals before opening smaller clinics, Max was going the other way around. For a while, Analjit had to bootstrap the business, even donning two hats, that of chairman and CEO for a couple of years starting 2005. Besides, insiders remember him being quite a stickler for detail. He is said to have been involved in every minute detail, even choosing the furniture in the office and hospital. It was only after loans from Asian Development Bank and International Finance Corporation fructified in 2003, did the business begin to stabilise. It was three years later that Analjit found the need to further restrict his management role. By then, the CEOs of the businesses were firmly in their saddle. The businesses too were well past their start-up phase. The healthcare business, in particular, had gained after Analjit roped in Pervez Ahmed, a renowned cardiologist and former director at Escorts. “Because we are in multi-businesses that are capital intensive and have long gestation… and also from the competitive and regulatory standpoint, I felt the need for professionals. By then, I had taken a view that my children will not be part of the mainstream of Max India. And finally, I needed more time for myself for my own personal evolution,” says Analjit. “One of the major changes in Analjit has been his new-found strong belief in processes, rather than managing transactions. The realisation that only processes can build a large business,” observes Tony Singh, a former CEO of BankAm who was the founding CEO of Max New York Life. That’s a dramatic change for the dyed-in-the-wool serial entrepreneur who used to trade in and out of businesses at lightning speed. Even till the end of last year, Analjit was all set to buy a stake in the Oberoi family’s East India Hotels, after P.R.S. Oberoi and he agreed verbally on a deal that allowed Analjit to buy up to 26 per cent stake in one of India’s foremost hotel chains. The deal fell through after Bikki Oberoi’s son Vikram and nephew Arjun raised objections to the idea of Analjit coming into their firm. Insiders say Analjit was terribly let down by Oberoi’s decision to call off the deal. Today, his hospitality venture is off the ground. And the Oberois now have a new competitor with lots to prove. In September last year, the entire life insurance sector faced a major upheaval because of the new stringent norms proposed by the regulator Insurance Regulatory and Development Authority. Max New York Life was no exception. The norms hit at the heart of popular unit linked insurance plans, or ULIPs. The regulator increased the lock-in period in these hybrid products. And it also asked companies to offer a minimum guarantee on pension plans and scaled down commission payable to the agents. The whole move suddenly threatened the very viability of the business. “We stopped everything and re-looked at the business inside-out,” says Analjit. This was the first real test of his governance model. 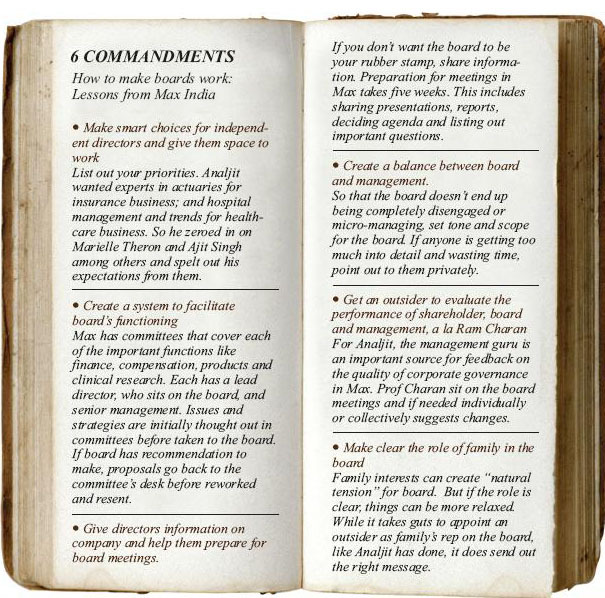 The board at Max New York Life worked in tandem with the management team to rework the strategy. Management consulting firm McKinsey & Co. was signed on as well to run through the strategic options. “We were out with a new strategy in four months. And the results are for you to see,” says Analjit. Since India had a high savings rate, the key was to figure out a way to tap that rather than focus on investment. What did customers typically save for? Education, marriage of children and retirement. So Max needed a suite of products that focused on these needs — and also well-trained agents. The early results are trickling in. In February this year, while most insurers saw their new premium collections go down, only two insurers were able to grow their business. Max New York Life was one of them. It saw its new business premium collections rise by 39 per cent, the second highest in the industry, while that of industry leader LIC fell by 44 per cent. Max New York Life now has a sustainable model of growth, with profits expected in the new financial year. There were quite a few people who played a stellar role in the strategy revamp at Max New York Life. Among them were two heavyweights on the board: Marielle Theron, a veteran from global insurer Swiss Re and Tony Coleman, chief risk officer of Insurance Australia Group, apart from William Beaty and Richard Mucci, the nominees from New York Life. Messrs Theron and Coleman are an intrinsic part of the crack team that Analjit gathered from around the world. Seven months before he roped them in, he hadn’t even known them. For someone who often demanded “getting into each and every point,” Analjit’s willingness to seek counsel surprised his own colleagues. There are reasons why Analjit is keen to leave behind a new legacy. “Right now, there are many things going in my head — Max, family, new businesses, my work with ISB [He’s investing Rs. 50 crore to build a part of the Indian School of Business’ second campus at Mohali]… but after five years, I want to spend 33 per cent of the time for myself and my personal pursuits. By then, my children would have taken some role in Max. Not in the daily operations, but in its governance,” he says. At 57, if that sounds like a semi-retirement plan, Analjit says he doesn’t deny it. In 2005, there may have been one more push factor: Tony Singh expressed a desire to move on. He was apparently keen to look at a new career as an independent director. He was particularly interested in governance and had already taken up independent directorships at global firms such as Perot Systems. Tony Singh and Analjit had been batch mates at the elite Doon School and worked side by side in rebuilding the Max group. Tony Singh had been his main sounding board for long. “No decision is taken without the knowledge of Tony,” says a close confidant. So, given the stakes involved, Analjit persuaded Tony Singh to stay back, elevated him to the vice chairman’s role at Max New York Life and also gave him the mandate to work with him in creating a stronger board. “Each of the businesses is complex. Regulations, products, finance… there were many issues. We needed more competencies and I alone couldn’t have handled all this,” says Analjit. With his full support, Tony Singh began brainstorming on how to strengthen the board. In early 2008, Analjit mandated multinational senior executive search firm Egon Zehnder International to search for experts in fields such as actuaries and those who could flag off important trends and technologies for the healthcare business. Theron and Coleman became a handful of foreign nationals on the board of the Indian firm. “According to an internal study we did, among the top 100 companies in India, there are only 22 independent directors of foreign nationality,” says Rajeev Vasudeva, managing director of the Indian operations of Egon Zehnder. Analjit himself got into the search mode and invited K. Narasimha Murthy. Murthy shared a seat with the Max chief on the board of IDBI. Murthy would typically put huge effort before every board meeting. “And when he spoke, everyone better listened to him,” recounts Analjit. Today Murthy sits on three of the four boards at Max India and heads audit committees of all of them. “I want to make sure that CEOs know that everything will be accounted for,” says Analjit. And it was clear from his other choices that he was not looking for yes men. Two of them were Aman Mehta, the former managing director of HSBC in Hong Kong and who sits on the boards of heavyweights such as TCS and Jet Airways; and N.C. Singhal, the former CEO of Shipping Credit & Investment Corporation of India and a senior hand at ICICI Ltd’s earlier avatar Industrial Credit & Investment Corporation of India Limited. Both of them are known as much as for their expertise as for their vocal opinions. 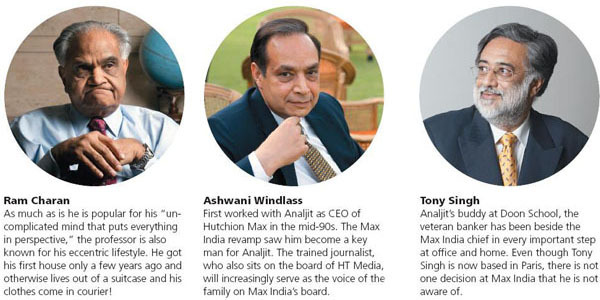 On March 30, when the entire country was obsessively following the cricket World Cup semifinal between India and Pakistan, all the 20-odd members of the Max India’s board too took off for Mohali. Just the previous day, the entire board had participated in an annual offsite meeting at Singh’s bungalow-turned-company guesthouse in Sector 5 in Chandigarh. This was an occasion for some blue-sky thinking on the future of Max India, beyond the normal functions of the board. The breakout sessions were informal, and the spirit of camaraderie was exemplary. Unlike the customary board meeting, the agenda was loosely defined. On the other hand, preparations for the board meetings would typically start five weeks earlier. “Papers and presentations are shared among the directors, agenda is set and questions listed out before the board meets, saving on time and energy,” says Theron. In fact, says Leo Puri, the India head of marquee private equity Warburg Pincus, “If anything, my only complaint is that Max India demands too much time from its directors.” The private equity has remained invested in Max India since 2004. Initially, Max India’s management team may have been a tad wary of his new governance model. Like Rajesh Sud, CEO and managing director, Max New York Life. Sud and his management team say that they’ve now learned to leverage the power of the board. “We now go to the directors not just to adhere to compliance, but to sound off strategies. We surely have difference of views. But these are discussed and debated before a decision is made… and surely, supremacy of the board is underlined,” says Sud. Some of that credit should go to Analjit’s teacher, mentor and now personal coach, Ram Charan. The management guru is the common link between the promoter, board and the senior management of Max India. Charan attends the board meetings within Max India once a year as an observer. He doesn’t speak, but approaches directors later with specific advice. Apart from this, Charan also holds session across the management layer of Max — from the chairman downwards to the directors and senior management of the group. Analjit has given Ram Charan direct access to his children, the board and the management. Of these, perhaps the most crucial is Charan’s talk with individual CEOs who represent the senior management — the lot which has historically felt squeezed between a powerful board and a demanding promoter. “Charan brings in the insider and practical view for us and helps me get a sense of the board function. It helps me understand the working of the system and also prepare myself,” says Ahmed. Most importantly for Analjit, Ram Charan not only aligns each of the management layers on the same track but also serves as a source of important feedback on the health of the enterprise. “Ram Charan is key to Max India’s operations and people,” says Analjit. But the success of the system itself depends on him and Charan, who occasionally sits and observes the board meetings. He says his pupil is doing the right things. “Discussion and dialogue in the meeting is candid. Analjit has encouraged viewpoints different from his. The key is that he wants good ideas and it doesn’t matter if the idea is opposing him or not,” says Charan. The sessions with Charan are an informal way to also help him keep tabs on his company. “I make sure I am aware of everything inside the companies within at least 36 hours of lag,” says Analjit. And when it matters, the chairman still likes to be in the thick of things. In the middle of March, Max Healthcare’s main hospital in the capital had a VVIP guest: President Pratibha Patil. On the day that the President was being discharged, Analjit made sure that he was there to see her off. There, he observed one of his employees handing over a rose to the President. That same day, he made sure that he sent a personal note to the employee to signal his contribution to customer care.